A hostage crisis involving three International Committee of the Red Cross (ICRC) workers may force agencies to stop bringing assistance to some areas, officials told IRIN, as humanitarian workers feel increasingly under threat in the hostile south. Stephen Anderson, the World Food Programme (WFP) country representative, said additional protection measures for his 60 local and foreign staff were paramount as the situation in Mindanao had become "dramatically more insecure". "We can still manage the risk, though we have taken a number of measures in terms of security," Anderson told IRIN. "It [the kidnapping] affects us because we are concerned about the welfare of colleagues who do the same type of work." The kidnapping of Filipina Mary Jean Lacaba, Italian Eugenio Vagni and Swiss national Andreas Notter had affected staff morale, Anderson said. "We've had some staff coming in from the outside and when they are given a choice between going to Mindanao and some other place, they choose elsewhere. They are nervous. We've had staff who have chosen not to come here," Anderson said. Lacaba, Vagni and Notter were taken by Abu Sayyaf militants at gunpoint on 15 January in Jolo, a southern island and Muslim stronghold, where government troops have been battling the rebels for years. Abu Sayyaf has not publicly demanded a ransom, although previous abductions have led to millions of dollars changing hands. Deadly clashes last week led to several Marine deaths, and dozens wounded on both sides, including the Abu Sayyaf leader Albader Parad. Another Abu Sayyaf unit is holding Sri Lankan peace advocate Omar Jaleel from the Nonviolent Peaceforce group, who was kidnapped on 13 February on the nearby island of Basilan. His fate remains unknown, although military reports have said he was sighted a week after he was abducted. 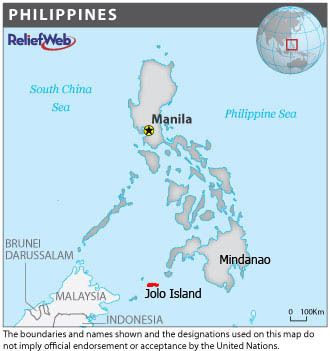 The kidnappers of the ICRC staff have been cornered in a remote jungle area on Jolo, and have threatened to harm the hostages if troops continued to advance. Amid the tense stand-off, Abu Sayyaf offered to free one of the hostages but then reneged. The ICRC in Geneva said the hostages last contacted Senator Richard Gordon - chairman of the local Red Cross - on 19 March, and they were unharmed. It said the three remained together but were tired and in bad health from moving around in the jungle. Gordon said the abductions could scare off international aid agencies. "The situation is very serious for our country. These are people who belong to a humanitarian organisation respected in the whole world. It is neutral and impartial in times of conflict and yet they were victimised," Gordon said, noting that the three had been working on a project to improve the lives of inmates in Jolo's provincial jail. However, Lan Mercado, Oxfam country chief, said the south was “a complex environment" where aid workers had to be aware of the perils they faced. "We need to be nuanced in our analysis and understanding of the dynamics that operate in every place in Mindanao," Mercado said. While security remains a major consideration for Oxfam in deciding what programmes to implement, it remains committed to helping those in need, especially those displaced by fighting, Mercado said. "Insecurity is not necessarily a deterrent and we do work in many insecure places in the world," she stressed. Anderson said WFP liaised closely with troops and police before going on missions, noting that if harm befell any of its volunteers, "it ends up jeopardising the entire operation. The main thing is that we try to adhere to certain procedures that may minimise the risk to our staff. It doesn't mean, however, that it’s 100 percent, and you can be in the wrong place at the wrong time, which sometimes is hard to avoid." In December, a truck contracted by WFP to deliver aid to a strife-torn area in Lanao del Sur province in Mindanao was ambushed by armed men, killing one Filipino. The attack was blamed on a Muslim bandit group.